Further Comments: Bishop Jocelyn drove away a dragon that had been terrorising locals around seven holy springs - the cathedral was later built in the area. Further Comments: When the church in Wievliscombe was being rebuilt, the devil manifested riding a green dragon and began hurling rocks at the construction. Saint Andrew materialised and used a crucifix to drive both Devil and dragon away. Further Comments: Sir John Conyers killed this worm by stabbing it under a wing, marking the spot with a stone and donating the used sword to Durham Cathedral. Further Comments: The dragon which took up residence in this area was killed by a knight; the lashing of the dying dragon's tail is said to have carved out a hollow in a field known as Wormstall. Further Comments: A long barrow located here is said to contain the most of the bones of a dragon killed by Sir Hugh Bardolph in the area. The dragon's severed head was sent to the king. Further Comments: A large snake-like creature wrapped itself around Bignor hill and squeezed so tightly that it left imprints of its coils. Further Comments: The local church gives the account of how a local dragon that was immune to arrows was put to death in a nearby field by Sir George de la Haye. A virtually identical tale exists from nearby Bures. Further Comments: Breathing fire as they travelled, the dragons in this region are said to have an interest in Bronze Age burial mounds scattered around the region. Further Comments: Treasure believed (by some) to be concealed in the area around the Iron Age hillfort has yet to be fully discovered - death and serious accidents have befallen all those to have tried. Another legend says that the treasure is protected by a dragon. Further Comments: Little is known about the dragon said to have been killed in this area. Further Comments: A winged serpent dwelt in Serpent's Well and would between the area and Cawthorn Park. Further Comments: The church is home to a spear that was used to kill a local dragon which lived in Athelney Fens - the creature snacked on the local livestock until a local hero bore arms against the beast. Further Comments: Leading to an untold amount of wealth, the tunnel hidden in this hillfort is guarded by a pair of snake-like dragons. The ghost of a druid is reported to haunt the site looking for this treasure, and the sound of phantom galloping horses have also been reported. Finally, another legend says the structure was formed by earth falling off the Devil's shovel as he tried to dig a hole in the South Downs. Further Comments: Crobhan killed the dragon that had levelled most of the island by having the beast chase him while he travelled with three horses. The hero ensured that the dragon ate the three horses during the pursuit, resulting in the dragon slowing down and tiring. Still being chased, Crobhan leapt across a series of barrels in which he had earlier hammered iron stakes - the dragon failed the jump, impaling itself on the stakes, ensuring Crobhan had an easy kill. Further Comments: The area was held to ransom by a fire breather who demanded a pail of milk once a day. The knight who engaged the dragon in battle barely made it out of the conflict with his life, and though the dragon lay slain, the victor died shortly after. Further Comments: Parts of this hill are bare and chalky - some legends say that a dragon was slain on top of the hill, and where the beast's blood fell, the grass died. Further Comments: A farmer watched in horror as his horses and plough were sucked underground in the middle of a field - a few seconds later a large dragon emerged and few off. The stone that remains today is said to cover the dragon's treasure. Some believe the dragon was in fact Satan. Further Comments: An ancient document gives reference to this place has being home to a dragon. 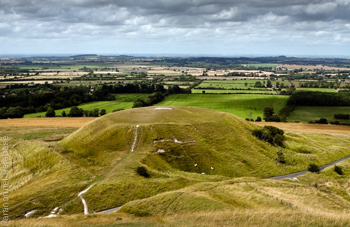 Further Comments: Some locals say that the two hills are actually a sleeping dragon. Another legend connected with the area says that either the king of Mercia or the king of Wessex lost a gold arrow here in the seventh century, and it can only be found by a seventh daughter of a seventh son. Further Comments: This dragon was discovered hiding amongst the tombs of the churchyard; it was finally slain by Sir James Tyrell. Some reports say the dragon actually lived in the nearby woods. Further Comments: A dragon which guarded a well managed to eat nine maidens who came one by one to draw water. It was finally slain by a man named Martin who was to be married to the youngest girl. Further Comments: The body of this cockatrice was covered with eyes, and it was said that the estates of Winston belonged to anyone who could see the creature before it could see them. One man managed to win the lands by hiding in a barrel which rolled into the monster's lair. Further Comments: The village is named after a local hero who slew a dragon, but died as the beast released a final breath of flame. In another version of the tale, John survives and finds a brood of hatchlings in the dragon's cave, which is subsequently blocked up. Further Comments: The local church gives the account of how a local dragon that was immune to arrows was finally chased into the marshes where it vanished. A virtually identical tale exists from nearby Wormingford. Further Comments: A dragon was said to reside in a tumulus, protecting its hoard.